Track and Trace is a method of following a product through the supply chain. In the pharmaceutical industry this is often referred to as e-pedigree. Government mandates to serialize pharmaceutical products are increasing around the globe. The California State Board of Pharmacy is requiring that 50% of each manufacturer's drug products be serialized by January 1, 2015, with the remaining 50% serialized by January 1, 2016. E-pedigree or electronic pedigree is an electronic version of the drug pedigree document. As defined by the U.S Food and Drug Administration as part of the 2006 Compliance Policy Guide for the Prescription Drug Marketing Act - " A drug pedigree is a statement of origin that identifies each prior sale, purchase, or trade of a drug, including the date of those transactions and the names and addresses of all parties to them." As a product moves from one place to the next, each company that handles the product must carry forward all of the previous e-pedigree information. When it reaches it's final destination, the retailer will have a complete document showing where that shipment has been and who has handled that shipment. This is done for many reasons. The primary reason is for safety, it helps protect consumers from contaminated medicine and counterfeit drugs. It also has benefits to the manufacturer. Having the ability to serialize down to the unit level can help cut costs associated with recalls, as well as being able to more efficiently manage their shipments. The first critical piece of the chain occurs right on the packaging line. Precise and consistent product handling, marking, inspection and data gathering are required to introduce accurate data into the front end of the system. 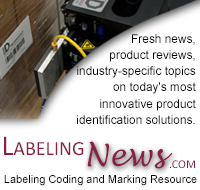 Although pressure sensitive labeling is the most common form of marking for bundles, cases and pallets, laser marking and ink jet coding are more common for units, because of space limitations and throughput speed requirements. LSI offers a variety of products to meet your Track and Trace and e-pedigree needs. One example of our track and trace and e-pedigree solutions is our Model 1400. It's a corner wrap labeling system that prints and applies labels to the corner of a case (video). Its flexible configuration allows for applying labels to either the leading/side panels or trailing/side panels of a case. We are experts in product handling, labeling and other marking technologies, bar code scanning, machine vision, RFID, controls and software interfaces, which are all crucial components to making your packaging line track and trace and e-pedigree ready. If you aren't sure which technology is best suited for your needs, contact an LSI representative to discuss your application.